This sleek jet is powered by the wind. 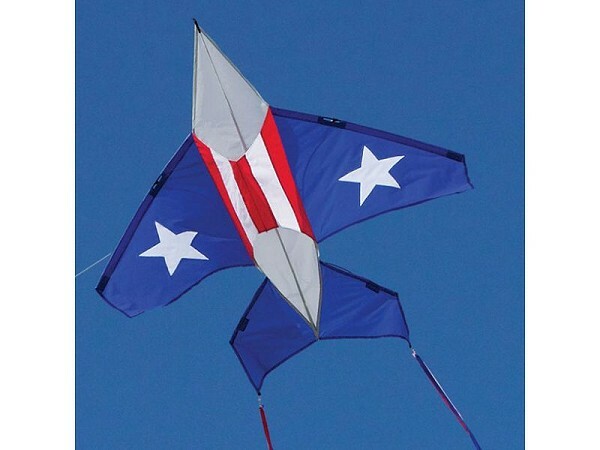 Based on a Delta kite with a tunnel keel, it's a stable flier that's great for beginners of all ages. Made of ripstop Nylon with Glassfiber spars, the Star Fighter has twin 5ft. streamer tails. It's ready to fly, with included 300ft of 50lbs flying line, right out of the 42" carry-case. Size: 49" wingspan x 46"